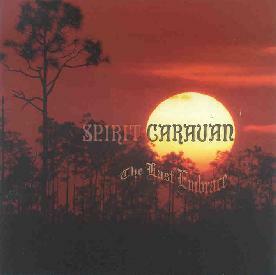 Spirit Caravan is heavy. It’s the classic three-piece: guitar, bass, drums. You take thick heavy guitar chords. Then you back up that guitar with a bass, doing just the right amount of pedal tones (the root note of each chord), to thicken up the chords. Next, you spend some time in the studio, twiddling a bunch of knobs, boosting and cutting frequencies, until you have an unbelievably fat sound. After all that work, you just might have the Spirit Caravan sound. Featuring Scott "Wino" Weinrich (guitar), Gary Isom (drums), Dave Sherman (Bass, Vocals). This 2 CD retrospective is truly an amazing record. I’m not really familiar with this band, but I am familiar with the sound. This is not your aggro in-your-face heavy-metal heavy. This is a thick, enveloping heavy. It’s a guitar/bass sound that’s been around for awhile. Think Blue Cheer (Summertime Blues) and Black Sabbath (Volume 4). It’s nice and refreshing. No screaming vocals, no ear splitting ego-guitar lines, just real good playing. I like it. The songs are very well put together and I just I just love that sound. For those of you that just have to know all the details, here’s what’s actually on the CD. 19 fully remastered tracks from ‘Jug Fulla Sun’ and ‘Elusive Truth’. The Shine (SC’s original name) versions of the songs “Lost Sun Dance”, “Courage”, and “Powertime”. Alternate recordings of “Darkness & Longing” and “The Departure”. Two never released on CD songs, “Undone Mind” and “So Mortal Be” from their last 7” and their final 3 songs never released ever.